The official Android Pie update saga has yet to get any sort of momentum. Android 9 Pie was released by Google for the Google Pixel/XL and the Google Pixel 2/XL in August. On the same day of release, Essential rolled out the Android Pie update to the Essential Phone. Since then, we have seen the OnePlus 6 receive official Android 9 in the form of OxygenOS 9.0. HMD Global has rolled out Android 9 Pie to the Nokia 7 Plus. Beta updates are ongoing for a few Huawei devices, and Samsung Experience 10 based on Android Pie is in development for the Samsung Galaxy S9/Galaxy S9+. As of now, that’s where the story stands. Quite a few device makers have revealed their Android Pie update roll-out timelines. In the case of HMD Global, the company has promised the Android Pie update for all Nokia-branded devices, which is nice to see. HMD Global has consistently distinguished itself with respect to software updates, and all new Nokia-branded phones are part of the Android One platform, which means they are required to receive monthly security updates. At the Nokia 7.1 announcement yesterday, HMD Global revealed that the Nokia 6.1 and the Nokia 6.1 Plus would receive the Android Pie update this month. Notably, the company is launching the Nokia 7.1 with Android 8.1 Oreo, but the phone will receive the Android Pie update this month as well. HMD Global added that the Nokia 8 and the Nokia 8 Sirocco would receive the Android 9 Pie update next month. As of now, the Nokia 7 Plus (which received official Android P developer preview updates in the past) remains the only Nokia smartphone to receive the stable Android Pie update. The Nokia 8 Sirocco remains the company’s current flagship as the Qualcomm Snapdragon 845-powered Nokia 9 is yet to be unveiled. If the company follows up on its promises by rolling out the updates on time, it will have once again distinguished itself against its competitors, which include the likes of Xiaomi, Honor, Motorola, Asus, Realme, and others. 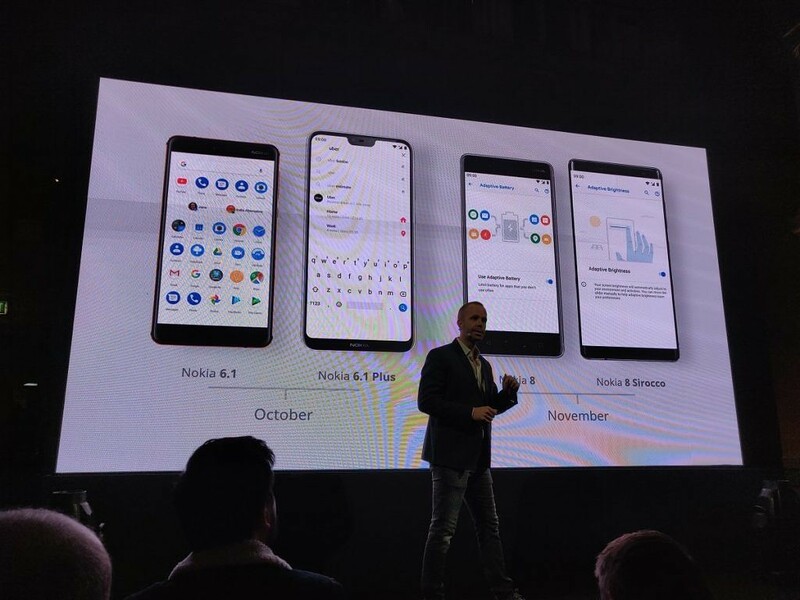 The Nokia 6.1 Plus, for example, would gain a competitive advantage in terms of software after receiving the Android Pie update.